Use the Community site to ask new questions. Can I create assets for a game which I intend to sell? Can I use Aseprite in several of my computers? Can I install Aseprite in 5, 10, or more computers buying just one copy? Is there an educational license? If Aseprite source code is available, how is that you are selling it? Can I sell graphics created with Aseprite? How do I rotate the selection? Is there a SNES color palette? Is there any difference between .ase and .aseprite files? Why do the colors change when exporting a sprite to a .gif file? Is Aseprite for Windows USB portable? I have a lag using my pen, is there any solution? Where is .asepriterc on Mac OS X? Does Aseprite run on Mac OS X 10.10 Yosemite? I cannot resize or maximize the window on Linux, why? Is there an official package for Linux? How do I run Aseprite standalone without Steam? How do you pronounce Aseprite? Aseprite icon looks familiar, where do I know it from? Yes, you do. With your purchase you will be able to download updates from Humble Bundle, Gumroad, itch.io, or Steam up to Aseprite v1.9. With the Steam key, the program will be updated automatically from the Steam client. See details about how do you update your Aseprite version. $14.99/USD is the minimum pledge amount to get the convenient .exe and .dmg files of the 1.x version series of Aseprite —refer to the roadmap to see what features we plan to implement in this series—. You're welcome to pledge more if you think it's worth it! You can use the donation page in case you already own Aseprite and want to show your support. Sure you can! We encourage it and we'd love to hear about your game on Twitter. Yes, you can. Official Aseprite packages are distributed under a specific EULA, and you are able to copy the program as many times as you want on your computers (and in different operating systems). If they are your own computers, yes you can. If you are in a company, you need one license for each developer. If you are in an educational institution, you can request a special license for educational purposes. In case you are a teacher in an educational institution, and you want to use Aseprite in your classroom, you can request a special license for educational purposes. Aseprite started being open source since its very beginning in 2001, and we were happy with that until August 2016. Now you can still download its source code, compile it, and use it for your personal purposes. You can make commercial art/assets with it too. The only restriction in Aseprite EULA is that you cannot redistribute Aseprite to third parties. No. From August 2016 you cannot redistribute compiled versions of Aseprite. We have replaced the General Public License (GPLv2) with the new Aseprite EULA. The only way to redistribute Aseprite is with an special educational license. Anyway this does not restrict most users: You can still compile the source code, and use the program to create your assets for commercial games. You can also make contributions to Aseprite or modify its source code for your personal purposes. Yes, you can use your own creations (sprites, animations, graphics, assets, etc.) in any product (personal or commercial) you want. Even with compiled versions of Aseprite you can create art for your personal/commercial purposes. Using keys 1, 2, 3, 4, 5, 6 (those above the QWERTY keys), or the mouse wheel. You can use the zoom tool too (Z key) to zoom-in with left click and zoom-out with right click. You can press the mouse wheel (middle mouse button), or hold the Space bar and drag & drop with the left mouse button. Also you can scroll one pixel pressing Space bar+arrow keys or one tile with Shift+Space bar+arrow keys. You have to use the Timeline. To open it you can press the Tab key or View > Timeline menu. Then you can click a layer and drag-and-drop the outline marker. See more information in the Timeline documentation. The Picture Processing Unit (PPU) used in the Super NES has a 15-bit RGB (32,768 color) palette, with up to 256 simultaneous colors at once. However, while the hardware palette can only contain 256 entries, in most display modes the graphics are arranged into between 2 and 4 layers, and these layers can be combined using additive or subtractive color blending. Because these blended colors are calculated by the hardware itself, and do not have to be represented by any of the existing palette entries, the actual number of visible colors onscreen at any one time can be much higher. The exact number depends on the number of layers, and the combination of colors used by these layers, as well as what blending mode and graphical effects are in use. In theory it can show the entire 32,768 colors, but in practice this is rarely the case for reasons such as memory use. Most games use 256-color mode, with 15-color palettes assigned to 8x8 pixel areas of the background. No. It's the same difference between .jpg and .jpeg. Both extensions can be used to save the full sprite information (layers + frames). The .aseprite alternative is given because Photoshop uses .ase extension for Adobe Swatches Exchange files. GIF files support only 256 colors. So if you are exporting a RGB sprite with more than 256 colors, or any kind of sprite with several layers with different blending modes, blurred areas, or special effects like glows, you will have problems exporting the image to GIF files. As a general rule: if you are going to export to GIF, you should use less than 256 colors on RGB sprites, or use Indexed sprites directly. Weird colors popping up in gif? what am I doing wrong? Anyway, sometimes you need to edit images with the full screen resolution. 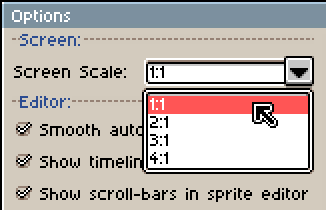 You can do so going to Edit > Options, and selecting 1:1 in Screen Scale field. You will need to restart the program after this change. The program works in both ways, depending if the configurations file aseprite.ini exists in the same folder where aseprite.exe is located. From Aseprite v1.0.2 the configuration is saved in the current user settings folder by default (i.e. %AppData%/Aseprite/aseprite.ini). Anyway, if you copy your aseprite.ini in the aseprite.exe folder, Aseprite detects that you want to carry your configuration with you, so the program acts like a portable app. a portable .zip version that you can uncompress in any folder. It's in your home directory (⇧⌘+H) as a hidden file. To see hidden files see this article. This is a recurrent problem of Linux users. The precompiled Linux distribution of Aseprite (which is not officially supported by our team) is linked to a shared version of Allegro 4 library. We've fixed this problem years ago distributing a patched version of Allegro 4 along with Aseprite source code. The problems is that we didn't find enough time to merge those patches upstream, i.e. official Allegro 4 library doesn't contain our patches to resize the window. We are releasing packages for Ubuntu (x86 and x64) at this moment. Fedora is being considered for a near future. Aseprite is completely DRM-free, anyway, using the default Steam option to create a desktop shortcut you will notice that it opens Steam to launch Aseprite. Regardless of this behavior, you can create your own direct shortcut to the Aseprite executable file to start Aseprite without Steam. When a new version comes out, you can get it from Humble Bundle, itch.io, or Gumroad. If you are using Aseprite on Steam or itch.io app, updates are installed automatic by default. If you bought Aseprite recently from the website, it's quite probable that you have used Humble Bundle to buy it, so you can give a try to the orders resender to get your Aseprite link or enter to the Humble Bundle library and search for Aseprite. If you bought Aseprite on Gumroad, you can get your download link from the original purchase email you've received (clicking the View Product link). Or you can check your Gumroad Library. You can always contact us if you have any issue downloading the update. We can resend you the receipt with your download link. It's a little "tribute" to what we think it's the greatest game of all times: Super Mario World. Specifically it references one of the few animated blocks of this game: the rotating block.